Christmas time is almost here, the time to bust out the classic Christmas traditions, and what better Christmas tradition is there than watching Dr. Seuss’ “How the Grinch Stole Christmas!” But maybe you want to mix it up a bit? “Dr. Seuss’ How the Grinch Stole Christmas! The Musical” is currently being performed at the Chicago Theatre. This musical retells the classical tale of how the Grinch stole Christmas through the narration of an older Max (The Grinch’s dog). The musical brings Dr. Seuss’ vision to life. The musical is in live action and sets themselves appear to be taken straight out of the book in which the musical is based on. My favorite part of the musical is when The Grinch is in disguise talking with the residents of Whoville and when asked where he is from, he answers with… Who-ston (get it… Houston). He then begins to talk in a very Texan accent. 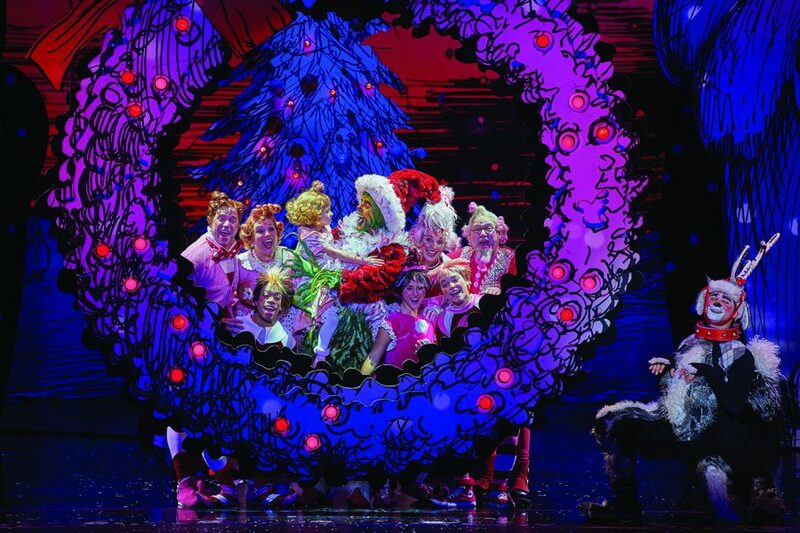 While the whimsical nature of the musical is a delight, the true brilliance of the play can be found within its performances, especially that of Gavin Lee who plays the titular character of the Grinch. In Dr. Seuss’ “How the Grinch Stole Christmas! 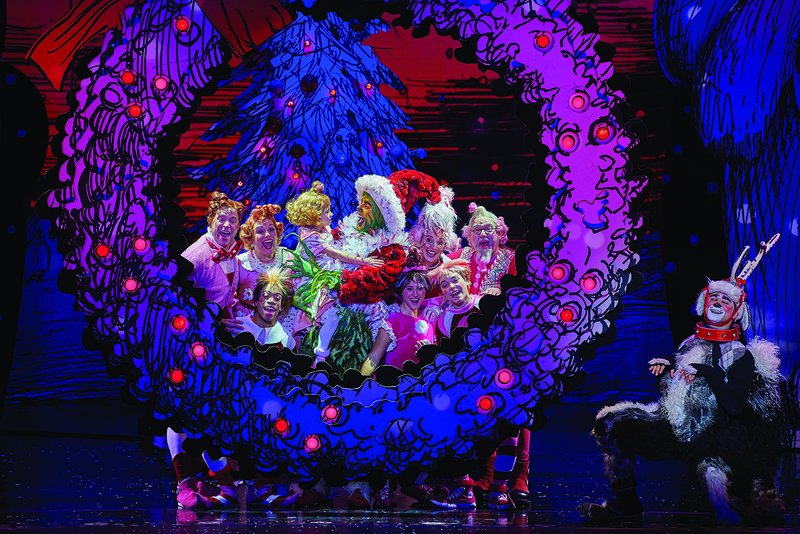 The Musical,” Lee plays the role of the Grinch and inserts a sense of charisma to the character. From the Grinch’s first appearance, he takes control of the scene and the audience as well, as this Grinch knows he is loved by the audience. The Grinch relishes in the audience’s’ applause and it is in these moments where the Grinch acknowledges and interacts with the audience. I believe this provides some of the musical’s best moments. Besides being a great actor, Lee spoke with one of our staff members about his work with this musical. He mentioned that it takes a while for his make-up to be applied onto his face and while he is grateful that the make-up is only applied on his face, the costume itself is pretty hot. He said this role is one of his most physically challenging role. While the role challenges Lee, he finds this role to be an entertaining role as the director allows him to experiment with the role. Lee is not forced to imitate the work of his predecessors, which allows him to truly make the Grinch his own character. When asked what it is he hopes for the audience to take away from his performance, he said that while the musical does take a few liberties with the story, it is still very faithful to its source material. It is this faithfulness to the source material that Lee hopes will reach out to the younger audience members but also to provide a sense of nostalgia for the older audience members who grew up with the book. When questioned about his previous roles and their connection to younger audience members, Lee talks about how he is willing to accept any role to come his way. They just so happen to be roles that lean towards a younger audience and by having kids of his own, he has come to appreciate his roles even more as he finds it fascinating that his children are at an age where they can come and see his performances. Lee said he finds himself identifying with the Grinch; Lee jokingly replied that he truly identifies with the Grinch when he must be up early in the morning. Lee considers himself to be a very cheerful person and he believes that we all carry a tiny bit of the Grinch within ourselves. Overall Dr. Seuss’ “How the Grinch Stole Christmas! The Musical” is a fun and entertaining Broadway musical that I strongly recommend everyone watch before it is gone. The musical will only be here in Chicago until Sunday, Nov. 25.